Hey, I've read that quote before. I think it shows up in one of the Bobby Fischer books I have on tap. Alright, the dust has cleared, and the bodies have been removed from the battlefield. Now it's time to take a look back at the game. I thought your double kingside sacrifice could have worked. You effectively destroyed the pawn structure defending my pieces and exploited my lack of developed pieces on my queenside. Specifically, my Queen's Bishop was blocked in, and that Bishop in turn blocked in the Queen's Rook. Several of your attacks raised complications for me that could have ended in my checkmate, and I had to tread very carefully. I think the reason why your attack failed in the end was because your Queen had no pieces to support her attack. Had one or both of your Rooks been brought to bear, I'm not sure that I could have extracted my King without having to make some sacrifices myself. As it was, your Queen, although threatening, was not capable of forcing checkmate on her own. Incidentally, there is an article up right now on chess.com about Paul Morphy's brilliant sacrifices. You can read it at this link. In other chess news, I've been doing rather poorly in my other games. In one game I brilliantly traded my Queen for a pawn. I resigned immediately. In another game, I was up a piece for a pawn after a fun pawn fork as my opponent was trying to exploit my Bishop being pinned to my Queen. Then I allowed the same Bishop to get pinned to my King, and lost it. Following that, I let my King get pushed away from the Rook it was protecting, losing that piece as well. Such is life. Ratings-wise, I'm at my lowest point in over a year. Such a reduction is deserved; I haven't been playing all that well lately, missing tactics that would win for me, and making moves that allow my opponent tactical opportunities to beat me. Hmm. That's sad to hear. I recently challenged a dude and the match lasted a whole three moves. And while it was nice to win on time, I didn't actually gain any points from it. Blast. Speaking of rematches, I wish I could get Marc to respond to the many thousands of requests I've sent to his account. Maybe, I should mail him a headless pawn as a sort of death threat to play. Do you think he would get the idea across or would it send him in a spiral of paranoia and fear from which he would never recover? So, what happens when a Yiddish space squid attempts a move at the game of kings? A Youtube video that last about ten minutes and some change, that's what. This is how I feel, at times, when I start a new chess match with Jon. Alpha Centauri wrote: So, what happens when a Yiddish space squid attempts a move at the game of kings? A Youtube video that last about ten minutes and some change, that's what. 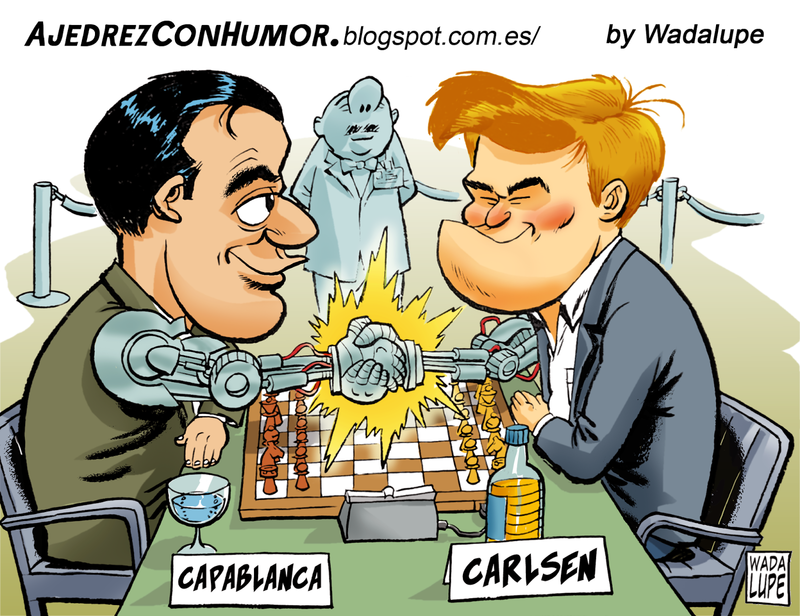 Alpha Centauri wrote: This is how I feel, at times, when I start a new chess match with Jon. There are those that say that chess will be "solved", and it may be that with perfect play on both sides White might win 100% of the time (like in this video), or that it will be like tic tac toe, with a draw 100% of the time. Others say that it is impossible to solve chess: there are more possible moves than there are particles in the universe by many orders of magnitude. That many possible combinations? Wow man, chess is like some kind of groovy cosmos. Look at the might of the universe at night and then look at a chess board and behold the universe trapped in a small wooden board. That last one was epic. This one will be beyond imagination. I'm sure it will be epic. Just as long as mud is provided. Who says a chess battle needs to end when the victor says, "Checkmate"? You have the power to bring the metaphysical chess battle into to the physical world. On and on into eternity. Or at least until the next chess match. Ha, ha! The man is speechless. Haha! Yeah, well it's a good thing that the one guy says "checkmate" at the beginning of the video, otherwise I would have been completely confused by the intent of the video. British humor (sorry... humour) is just, well, different. British humor lies in two separate camps. On one side, you have reserved humor with Brits acting up to cultural expectation while on the other you have a more liberal approach to the funnies with reserve and manners tossed into the nearest bin (trash can). The clip above is from a show that falls squarely into this more liberal approach to humor, which became common in Britain around the 1970s thanks to comedy groups like Monty Python. It's the only way explain the greatness of these two great players. It's the only way. Here's a neat little chess match up. JLA vs. Avengers! I like this matchup because I can imagine every hero as representing the piece space they occupy. I am most amused by having Flash and Quicksilver as the pawns. Sure, they are only two guys; but since they move so fast, why not have them duplicate so as to fullfill all the pawn duties at once? In a glass case huh? Someone thinks very highly of that chess set. Hey, I would if I had a chess set like that. Too much finger grease might corrode the fine plastic figurines is what I say. So how many games of chess are there? Way back in the 1950s, (you know when making chess computer programs were all the rage) a scientist named Shannon came up with the number of 10120 possible games. In this video, Youtube user Numberphile tackles this question with gusto and discovers all sorts of interesting points on the subject. The number of chess games increases dramatically even after the first move!